Y'all are gonna be so excited to hear that I purchased three necklaces today, none of which are a varying color or the now infamous bubble necklace (all from J.Crew, however). I was so crazy about this outfit yesterday. My mom is in town so we hosted a girls night for her that included sushi, drinks, and dancing. I was sooooo happy to have worn wedges because I was on my feet for about 8 hours straight. This bubble skirt probably isn't the most flattering skirt in the world, but it is extremely comfy. I love the high waist and am crazy about the color. A little house news for you: check out the background... it's a fence! I bought an older home and back on the '60's, it wasn't common to have a fence because it isolated you from your neighbors. Call me crazy, but I don't want to share every little thing that goes on in my back yard with the rest of the town. Plus, the old man that sits on his back porch day and night, staring at my house must wonder why I am out there twirling around and smiling into a camera at 8 am every morning. Anyways, I'm sure that my girls are so happy to go outside on their own. Walking around in the back yard with a leash can't be possibly be as fun as having the freedom to smell each and every inch of it. Tomorrow we plan to go "boutique-ing". There are several boutiques here in Dallas that I have been wanting to visit, but they are all in different areas of the city. We've planned out a map of the ones we want to visit, stopping for lunch at a new spot, and dessert later. I can't wait to share what I find! 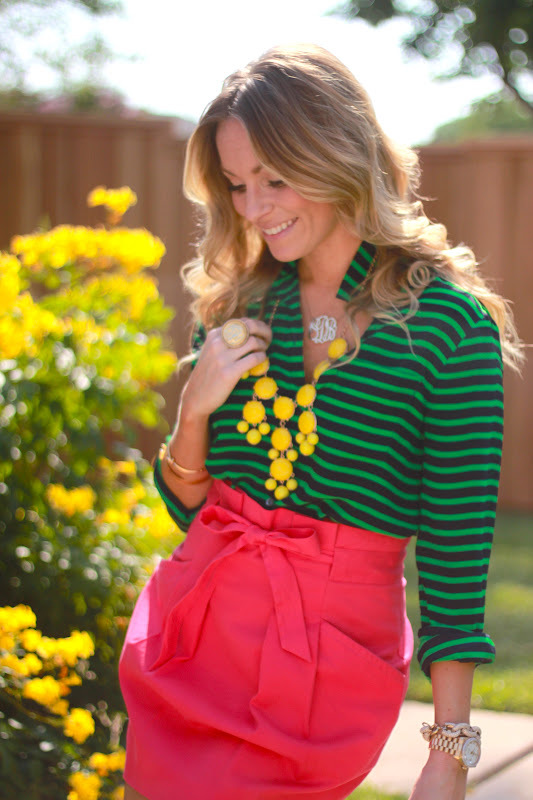 Top: J.Crew, no longer available, but similar from Equipment and on sale! Good idea to put the fence up, I would have done the same.... it's a great backdrop for your photos anyway, really makes the colours pop! Love this! I totally shanghai-ed your wedges. They'll be in my hot little hands by Wednesday. Rad. I love this outfit!!! I love the color mixing! !